Completed a Moto Gymkhana event? You’re entitled to 10% discount on your motorcycle insurance with Devitt! Here at Devitt, we understand that those bikers who go above-and-beyond to improve their riding skills and knowledge soon become safer and secure on our roads, that’s why we’re working in partnership with Moto Gymkhana UK to offer 10% discount on your motorbike insurance if you’ve completed a course. Moto Gymkhana is often known as the ‘dark art of motorcycling’, it’s an advanced motorcycling course like no other on the market – it’s a time trial sport at its finest. 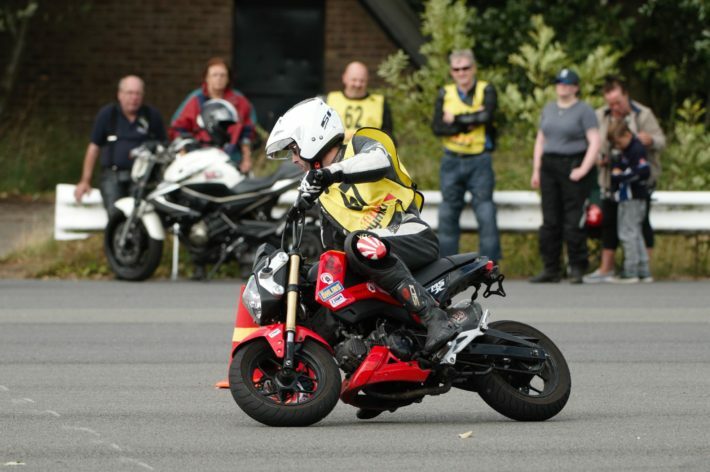 It’s all about learning to control your motorcycle to a tee whilst competing against the clock to see how quickly you can complete the course. ‘Gymkhana’ is popular event for horse riders that’s usually made up of speed pattern racing and timed games, the premise of this was then adapted for motorcycles back in the 1960’s. Japan founded the Moto Gymkhana craze with dealers creating trials clubs in their car parks. It wasn’t long before it became a sensation sweeping the nation. The first British club was launched in 2011, it’s gone from strength to strength ever since. What makes it so great for people looking to advance their riding skills in a fun environment, and it doesn’t matter what motorcycle you ride because Moto Gymkhana is suitable for all; it’s all about learning to control your bike better. Claiming your 10% insurance discount for your motorbike couldn’t be easier now you’ve completed a course with Moto Gymkhana; all you need to do is simply click the ‘Get your discounted quote’ button in the banner and you’ll be taken to our dedicated Moto Gymkhana quote system. Your 10% discount will be automatically applied. Alternatively, call our contact centre and inform one of our helpful advisors that you have via that you completed a Moto Gymkhana course to obtain your discount.